Investors have a mega media merger to digest Thursday, but that looks unlikely to give the broader market a boost following a bad batch of economic data. U.S. stock futures were lower ahead of the open, as investors reacted to a report that showed retail sales unexpectedly fell in January. Economists were looking for no change last month, but sales dropped 0.4%. Investors were also disappointed after unemployment claims came in higher than expected last week. 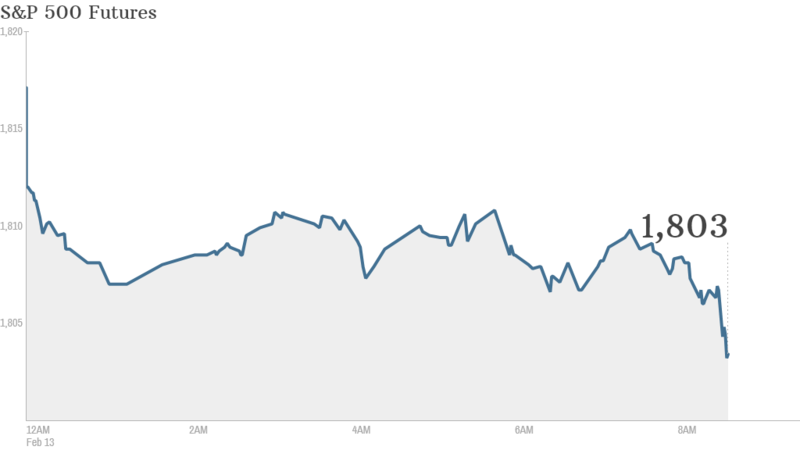 Markets ended mixed Wednesday as investors took a breather after a four day winning streak. On the corporate front, Comcast (CCV) announced plans to acquire Time Warner Cable (TWC) in a $45 billion deal that would combine the two biggest cable companies in the United States. Comcast has agreed to pay $158.82 per share for Time Warner Cable, a 17% premium to Wednesday's closing price. Time Warner Cable shares jumped 10% in premarket trading, while Comcast rose slightly. Also, shares in a smaller rival -- Cablevision Systems (CVC)-- gained 2%. Bad weather on the East Coast could also keep markets subdued. It has already forced Federal Reserve Chairwoman Janet Yellen to postpone her second appearance this week before Congress, which was due Thursday. Her first day of testimony as chairman sent stocks sharply higher Tuesday. In other company news, PepsiCo (PEP) announced an increase in quarterly profit and revenue. Shares made slight gains. Goodyear Tire & Rubber Company (GT) reported an increase in operating income for the quarter, compared to a year earlier, but a decline in revenue. Kraft Foods (KRFT) is also scheduled to announce quarterly results on Thursday. Netflix (NFLX) said it acquired the rights for the animated series "Star Wars: The Clone Wars." Dow component Cisco Systems (CSCO) raised its dividend despite reporting lower revenue and earnings. Weak revenue guidance disappointed investors. European markets were weaker in afternoon trading, while Asian markets ended with losses, led by the Nikkei, which fell 1.8%.